Suspension bridges are sophisticated constructions involving a lot of elaborate engineering plans, lengthy preparatory proceedings, both bureaucratic and practical, and precise construction procedures. The results are grandiose: the world’s great suspension bridges are noteworthy landmarks, essential passageways across water and testimonials to man’s ingenuity and engineering expertise. However, they can cost a packet! The eastern replacement span of the Bay Bridge connecting Oakland and San Francisco was finally opened in September 2013 after over eleven years of construction work and a cost exceeding 6.4 billion dollars. Fifty feet of the bridge had collapsed following an earthquake in 1989. Reconstruction work immediately began and the bridge reopened. However, it was evident that more lasting, earthquake-resistant work was required and it was decided to rebuild the entire eastern span. 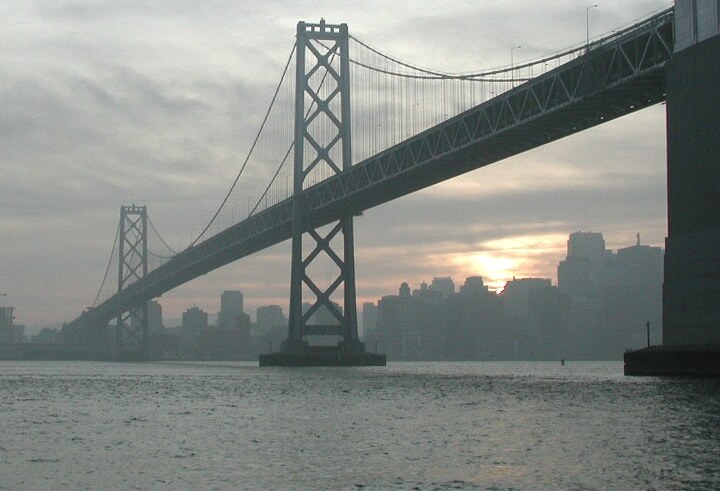 The Bay Bridge is the most costly suspension bridge ever. If there were ever any need to consolidate this extraordinary record, we could add the cost of the original Bay Bridge, opened in 1936: 1.3 billion dollars. This bridge opened in 1998 and cost 4.4 billion dollars. It is part of the Great Belt Fixed Link and connects the Danish islands of Zealand and Funen. This remarkable bridge is 4.2 miles long, the longest bridge span outside of Asia. The famous Verrazzano-Narrows Bridge in New York connects Staten Island with Brooklyn. It was opened in 1964 with a cost of 2.4 billion dollars. It was named after the Florentine explorer, Giovanni da Verrazzano, who was the first European to reach here in 1524. This bridge has become universally famous as the New York Marathon starting point. Like the Bay Bridge replacement section, this is a self-anchored suspension bridge, i.e. the principal cables are not attached to the ground but to the bridge itself. The bridge connects Yeongjong Island to the mainland of Korea and cost 1.9 billion dollars. This great bridge of China cost 1.35 billion dollars. It connects Lantau Island, and the new airport, to Hong Kong. It is the longest suspension bridge that supports both road and rail traffic. This entry was posted in Bridges and tagged bridge, bridges, history, suspension bridge. Bookmark the permalink.